Free Wi-Fi and an outdoor pool make for a value-packed combo at the Travelodge Walla Walla with easy access to the highway and public transportation. 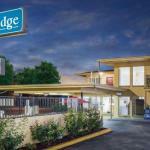 This two-story Travelodge offers 39 rooms with cable TV and coffeemakers. Some also have microwaves and mini-fridges and Wi-Fi is free. Grab a snack from the vending machines for the road. In the summer work on your tan line by the outdoor pool. Pets are welcome for a fee. Parking is free. Bistros wine cellars and family restaurants are within two blocks of this downtown hotel. Whitman College is two blocks away as well. Explore Kirkman House Museum or roll a strike at the Stardust Lanes both a half-mile from the hotel. Walla Walla Medical Center is one-and-a-half miles south. A bus stop is less than a block away and Walla Walla Regional Airport is three miles east.